What the hell, Luxembourg wins two Grand Prix competitions in one day (and with big scores). Now they just need a solid 3rd rider (not impossible), and they shall become one of the top 7/8 teams globally. And once again watching Abbott & Euro Prince is impossible without saying wow and laughing all the time. They approach the fences twice as fast compared to everyone else. And it's for nothing as they fell in the final minute. Here we go, mere five minutes after his 12 minutes cross-country ride, Harry Meade is already "guest" commentator. Can't believe ground jury actually gave a yellow card to Oliver Townend for whipping his horses all over the Badminton course. But then again, yellow card means absolutely nothing and he will continue tomorrow on his overnight scores like nothing happened. How wonderfully convenient for them. Jonelle Price & Classic Moet (28.0) lead the way after posting the fastest round of the day. Nobody made the optiumum time as Jonelle was one second outside. Nice rounds for Kieffer (who finally changed her pedestrian pace and million time penalties trends of 2017! ), McCarthy, Toddy, Murphy, O'Hanlon, Diaz Fernandez. Okayish round for Griffiths, probably too slow. 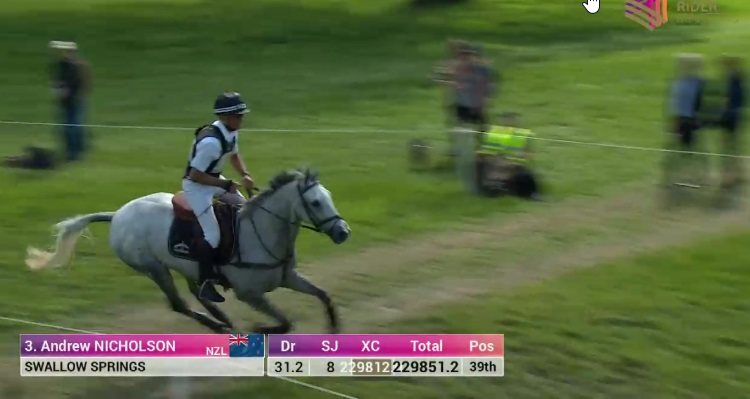 Also it was interesting to see Virginia Thompson coming out of nowhere (well, southern hemisphere), and posting a surprisingly good round, despite getting 11 penalties. Jonty Evans & Cooley Rorkes Drift once again encountered cross-country problems. I'm not sure anymore if they have long format in them, as still they haven't jumped clear outside of short format since Rio 2016. They literally still don't even have minimum requirements for WEG as of now. Thank you for saving otherwise awful show jumping stage. 12 hours after saying: "I can win ugly, and whatever way it takes." So, according to this, Andrew Nicholson has managed to collect 229851.2 penalties. Damn, now they have GP riders. If one more appears then Palestine could seriously challenge for Olympic team qualification since South Africa is struggling at the moment. Can't imagine how hilarious would it be if half of Palestine's Olympic team is made of dressage riders.